Asus isn't a household name in the U.S. when it comes to smartphones, but it is trying to make a strong statement with the Zenfone 2, which packs more storage than similarly-priced competitors. The Zenfone 2, which has a 5.5-inch display with a resolution of 1920 x 1080 pixels, starts at $199. It will begin shipping on Tuesday with Google's Android 5.0 OS. A model with 4GB of RAM and 64GB of storage goes for $299, while the $199 model has 2GB of RAM and 16GB of storage. The smartphone is shipping as an unlocked device, meaning it will work with multiple carriers. It has an Intel 64-bit Atom Z3580 processor code-named Moorefield and a PowerVR G6430 graphics processor, which is capable of handling 1080p video rendering. The Zenfone 2 has a 5-megapixel front camera and a 13-megapixel rear camera, as well as two SIM slots. Asus wants to make a mark in the U.S, and with this smartphone it hopes to find an audience, said Jonney Shih, chairman of Asus, during a press event in New York. The ZenFone 2 is already shipping in 15 countries worldwide. 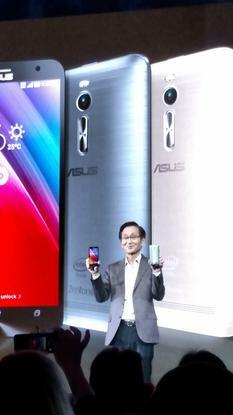 But for the U.S. market, Asus has tweaked the smartphone with some new features including a better LTE modem. Other features include 802.11ac wireless and LTE-Advanced capabilities. The device supports carrier aggregation, and LTE data transfers can touch up to 250M bps (bits per second). This is also a big product release for Intel. The Zenfone is the second smartphone in the U.S. that uses one of its chips. It's also Intel's first smartphone in the U.S. with the XMM 7260 LTE modem. An Intel chip is already being used on Asus's Padfone X Mini, which is primarily a 4.5-inch smartphone that turns into a 7-inch tablet with an accessory. Intel's chips are mostly being used in handsets sold in developing countries.